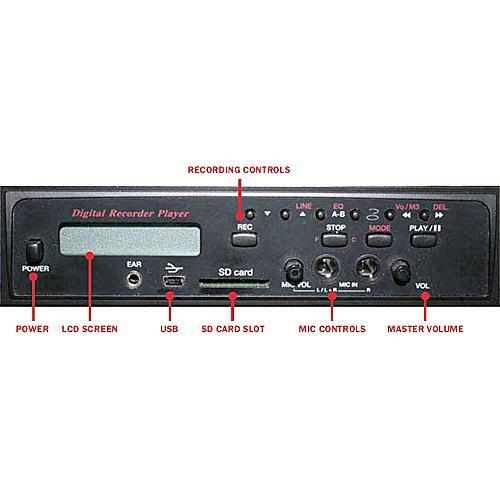 The Amplivox S9160 Digital MP3 and Wave File Recorder / Player Module is an installable option for the SW915 Digital Travel Partner portable PA system. The S9160 installs into a module slot on the SW915 and will record and playback MP3 audio files or uncompressed Waves. Its 128MB internal Flash RAM supports up 120 minutes of audio, and the SD card slot will support a 2GB card for 32 hours of audio. Transferring audio files to and from a Windows PC is easy; simply connect the S9160 via USB and the PC will recognize it as a storage device. 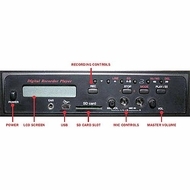 Additional features include microphone input jacks (1/4" phone), volume control for output and mic input, 99 recording tracks and an LCD display. The S9160 is a complete, on-board audio solution that compliments the SW915 Digital Travel Partner.